The right hiking boots can mean the difference between an enjoyable trek and a painful one. The proper shoes can keep your feet and legs healthy and energized over a long multi-day hike or climb. The wrong choice, however, can make every step a painful, miserable experience. 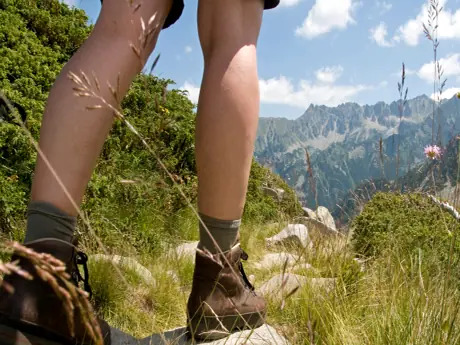 Here are some tips on how to buy the best hiking boots to ensure your next trek is about enjoying the outdoor experience, not coping with foot, ankle or leg problems. Low-cut, high-cut or mid-cut? Leather, synthetic or a combination? Rigid or flexible soles? There's a dizzying array of hiking boots to choose from these days. But you can make a lot of headway toward narrowing those choices before setting foot in a store. First, ask yourself what type of hiking you primarily plan to do. That will determine how much protection and support you'll need. If you mostly take day hikes on established trails with a small pack, you can probably get away with light, low-cut hiking boots with softer, flexible midsoles. They won't provide the most support, but they're more comfortable. In fact, a lot of experienced ultra light backpackers choose these, even for long treks. But if you prefer multi-day treks, avoid well-maintained trails, or carry a 35-pound pack on your back, take closer consideration. In these cases, you'll probably want high-cut shoes for ankle support. You'll also need a rigid, sturdy sole with a deeper tread. You don't want your feet flexing around every rock and root you step on. If you're likely to be hiking over a variety of trails and distances, there are plenty of great options for hiking boots that fall in the middle of these two extremes. Be specific when talking to your local show retailer to get the right shoe for your needs. Chuck Scott is a freelance editor and writer with 30 years of experience in sports journalism. He is also an avid backpacker and camper..